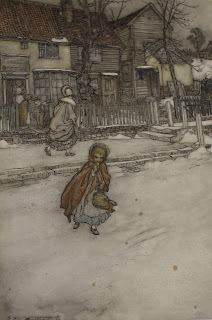 In late December the library acquired an original drawing created by Arthur Rackham. 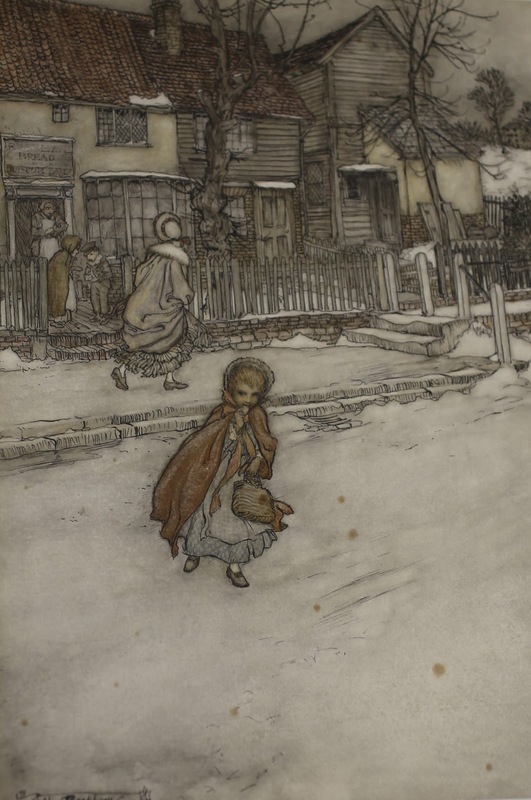 Rackham was one of the most prolific and successful illustrators in the early twentieth century. The illustration supplemented the now over ninety original works of art drawn to illustrate children’s books founded by Francis and Mary Lois Molson. A resident of Britain, his illustration was extraordinarily popular on both sides of the Atlantic. 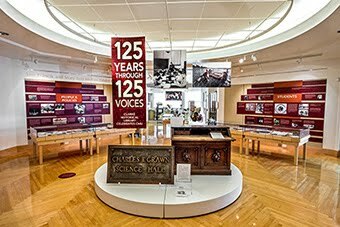 The Clarke Historical Library is fortunate to have a large collection of Rackham publications—depending on the title, the Clarke holds a signed “limited” edition, a first United States trade edition, or a first British trade edition. And in some happy cases, all three of the same book; happy particularly for the publishers because they quickly realized that adding a variant illustration or two into each of the three volumes would force serious Rackham fans, as well as libraries with Rackham collections, to purchase all three editions. Unlike his books, original Rackham illustrations are rather hard to come by. When Sotheby’s in London offered several for auction this December, the library, using funds from the Francis and Mary Lois Molson endowment, was able to obtain one of the offered drawings. It was from Washington Irving’s Rip Van Winkle, Rackham’s reimagining of that classic New York story about a man who took a very, very long nap. Rackham’s Rip Van Winkle was published in 1905. Rip Van Winkle is often described as Rackham’s “break-through” book. Although already a professionally well-known illustrator, the color illustrations in Rip Van Winkle made Rackham a “household name” and launched him on what would become a legendary career. The staff was thrilled to add this wonderful addition to the collection, and grateful to the Molsons for their original gift of art drawn for children’s books as well for creating the endowment that helps make additional purchases to expand the collection. On March 15 Jane Hash, of Classy Little Fashions spoke as part of the Clarke Library’s spring speaker series. Born with Osteogenesis Imperfecta, Hash jokes that while she weighs about twice as much as her cat, when the cat stretches out he is longer than she is. As one might expect, Hash told a variety of stories about growing up. One of the more amusing she told at the reception. As a young girl of about seven she often got tired of other children asking her why she was so small. One day, without thinking much about it, she responded to the question by saying, “because I took a hot bath and shrunk.” Somewhere in America there may be a traumatized middle aged person, who avoids hot baths at all costs. Her small stature led to a wealth of other stories she shared. While she was in college, Jane and a friend decided to go to a party, but when they arrived the back of the car wouldn’t open and allow them to get out Jane’s wheel chair. In the spirit of a great many college students, Jane shrugged and said, “I’m only going to get a drink anyway,” and her friend carried her into the gathering. Later in the evening one of the guests left in something of a huff, and they later learned the guest was quite upset about ‘that woman” giving a margarita to her baby. As she writes, “I reacted to this frustration like anyone else would. I posted a rant on Facebook. That proved to be one of the best decisions I’ve ever made because it lead to the solution." Classy Little Fashions not only designs age appropriate clothing, it offers counseling to its participants. Hash described her own struggle with her body image, including many self-destructive behaviors. As she eventually realized, while being about two feet six inches tall adult is a very atypical, many people struggles with body image. Almost everyone would like to be a little more something; thinner, taller, shorter, stronger, have a different shaped nose or any of the other things people can obsess over. The issue is not one unique to people with Osteogenesis Imperfecta but one widely experienced – which in the end was Hash’ point; appearance and size does not determine ability; although she did admit finding well-fitted clothing does help in getting people to listen seriously to her (something we all might reflect upon for a moment when we consider another person’s ideas). 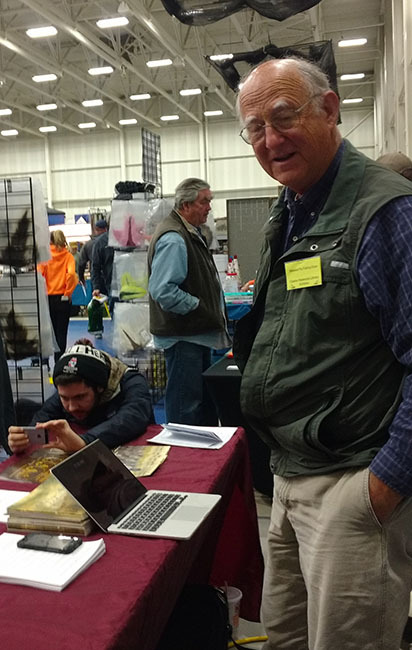 March 10 and 11 Robert Kohrman and I spent the weekend representing the library at the Midwest Fly Fishing Expo. That may sound like a peculiar place for us to be talking to people about the Clarke Historical Library, but with over 3,000 angling books in the library which taken together make up what is arguably the strongest collection of fly fishing books in the Midwest, spending a few days talking about our holdings among people who enjoy the sport is a sound outreach strategy. Bob, who is a true expert on the sport and the literature, and I, who can kind of talk the talk if I have to but have never walked the walk (that is, gone fly fishing) have attended the show for several years with three goals in mind. The first is simply to let people interested in the sport know the collection exists. The second is to find individuals with book collections on the subject and encourage them to think about donating those books to the Clarke. And the third is to reach out to individuals interested in the sport to support the endowment within the Clarke that allows us to continue to grow the collection. One of the intriguing aspects of sitting for 14 hours on the floor of the show is that you never know to what topic the next conversation will turn. Over the course of the weekend we talked to a number of Chippewa alums who groaned when they realized that for four years all those books were just a few steps away – and who we encouraged to make a trip back to campus. We also talked to a hobbyist boat builder absolutely fascinated by a model of the original Au Sable river boat that we had on display, and was interested in possibly building a full size replica. And we talked with a gentleman who may have the only surviving notes about rod construction left by one of Michigan’s most famous rod makers. And of course there were the book people. John D. Voelker, one of Michigan’s most celebrated authors and fly fishers, once wrote, “Old fishermen never die, instead they write books about their passion.” In truth, fishermen read books about their passion rather than write them, and are equally passionate about their book collections. Those passionate readers are the reason two book dealers routinely set up shop at the show – they know there is a market there for their wares. Those passionate readers and collectors are also people to whom we like to talk. Fly fishing in Michigan is deeply linked to the state’s history. The “holy water” of the Au Sable River is steeped in fishing lore, as are many other Michigan streams. There is also a practical aspect to documenting the sport – fly fishing is a major recreational activity and an important factor in the state’s tourism industry. The Clarke’s angling collection gives researchers, a state, national, and international perspective on the sport. As always, my thanks to the Michigan Fly Fishing Club, which sponsors the show and again this year kindly granted us a complimentary vendor table, and to Bob Kohrman, who volunteers to spend those long hours at the table with me, and who saves the day whenever someone asks a real question about fishing or the fly fishing literature.